Inventory We are a resale marketplace, not a box office or venue. Ticket prices may exceed face value. This site is not owned by Key Arena . 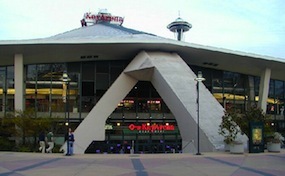 The Key Arena at Seattle Center opened in 1962 on 305 Harrison Street in the 74-acre entertainment complex known as the Seattle Center at a total construction cost of $74.5 million. Key Arena used to be home to the National Basketball Association's Seattle Supersonics before they left for Oklahoma City in 2008. The Key Arena box office provides a 16,641 seat capacity for most center and end-stage concerts. Key Arena tickets have included such memorable acts as The Beatles, Elvis Presley, David Bowie, Queen, Nirvana, Pearl Jam, and Metallica. ArenaSeattle.com is not affiliated with any primary box office or supplier. We are a privately owned and operated business specializing in sales in the secondary market. To buy tickets for any KeyArena events in Seattle simply click on the event of interest or call our operators at anytime.